I’m a girl. 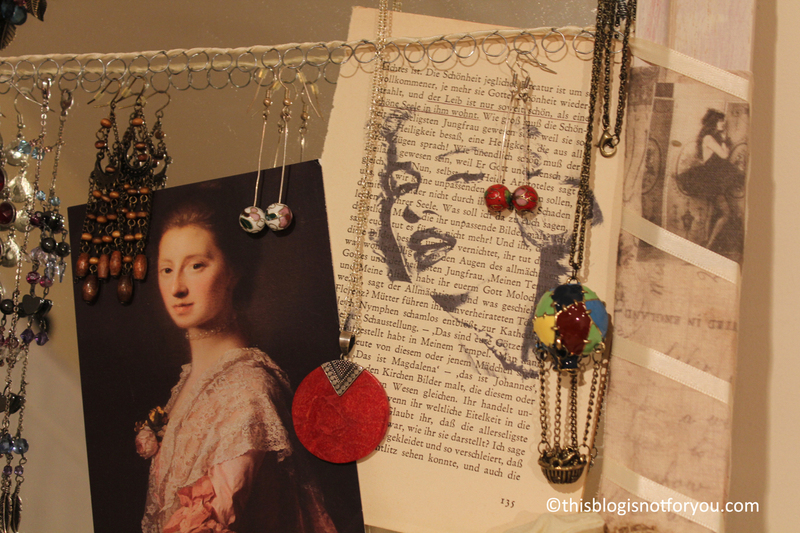 And I adore jewelry. Of course. I love buying it, wearing it and making it myself. The only thing that annoyed me for years was not knowing how to store it. 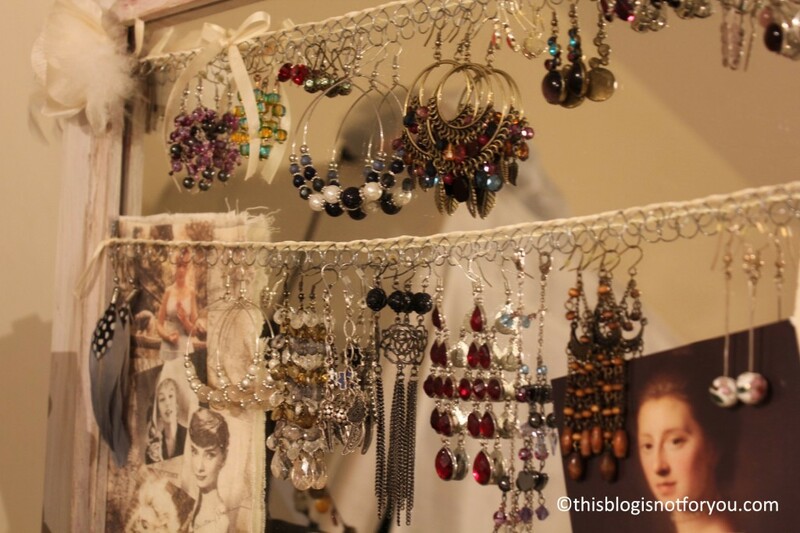 I have a really nice jewelry stand for necklaces, but nothing for earrings – one of the reasons why I often wear the same earrings for weeks, because I don’t think of all the others stored in little boxes somewhere. 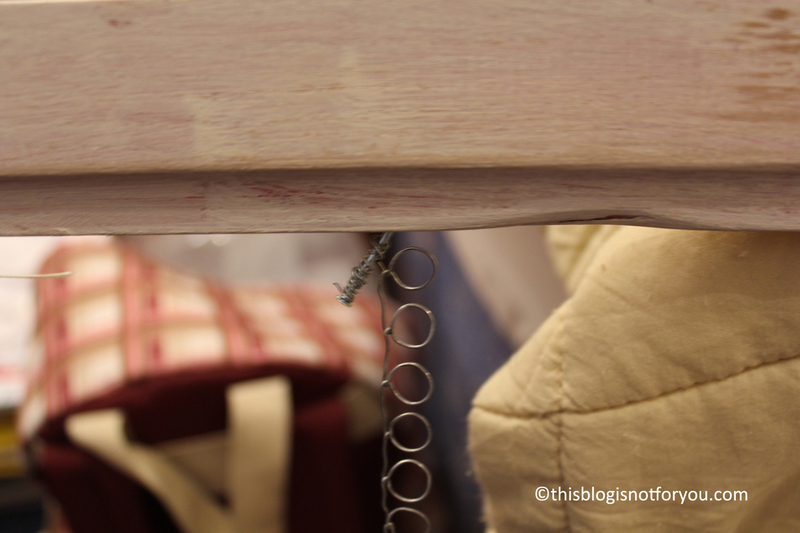 I found some really nice earing holders in a cute shop in Covent Garden, but too expensive for my taste. Nevertheless, they did inspire me to make my own. 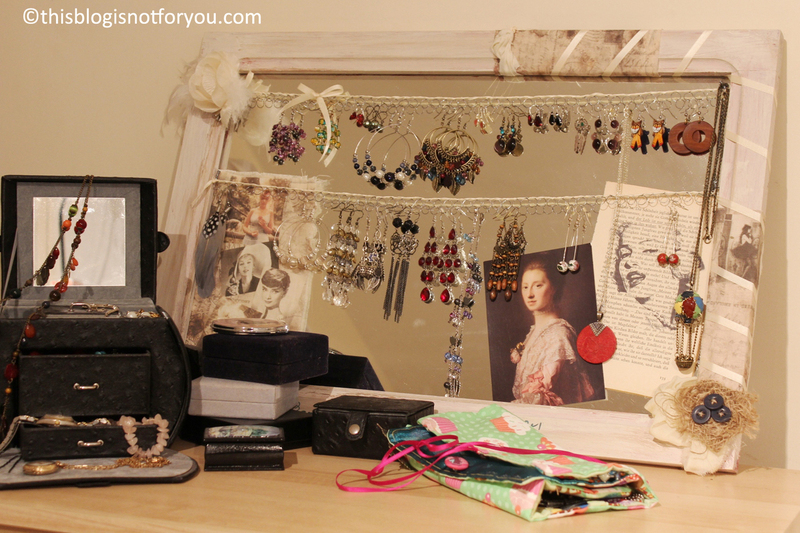 Since I love how everything’s reflecting in the mirrors in jewelry shops and therefore looks so much nicer, I came up with the idea of upcycling an old mirror that has been waiting in a corner for months. (So old that it has an “made in GDR” stamp on the back cover). It was rather easy to do, but it took some time and creativity to decorate it. If you got an unneeded mirror and an old wooden frame, some wire and some bells and whistles for decorating, it’s easy to copy. The mirror’s original colour was red. Before painting it and adding wire and decoration, I removed the back cover and the glass panel. First I sandpapered then painted the frame. (I did not only use plain white paint, but also light browns, ivory and grey to make it look more vintage). I used some old florist’s wire and shaped it with help of a pencil. 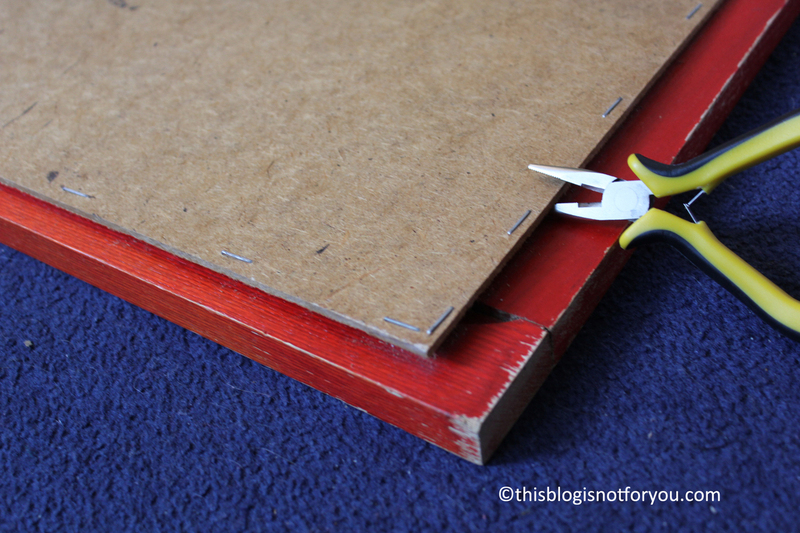 I attached it to the frame by wrapping the ends around small nails (1”) . I printed pictures on book pages and cloth, wrapped satin ribbon around the wire and found some pretty postcards to glue on the mirror. Finally, all my little treasures have their own display. We haven’t found a way to nail stuff onto the wall yet, since we don’t have wallpaper in our new flat (the plastering starts crumbling immediately 🙁 ). But it doesn’t look too bad sitting on the dresser. Da warst du ja mal wieder voll in deinem Element! Toll- den Spiegel hab ich von Gitta bekommen, da war ich 9! Ich freu mich, dass du ihn so gut gebrauchen kannst. Wie hast du den Druck in dem Buch hingekriegt? Wow…dann ist der Spiegel älter als ich dachte! Ich habe die Buchseite in die Mitte eines A4 Blattes geklebt und dann normal gedruckt. Mit Word oder Photoshop muss man vorher nur das Bild auf die Stelle des Blattes positionieren, auf der die Buchseite klebt. Macht sich auch wunderbar für Paketanhänger oder Grußkarten! So I just learned that this mirror is over 30 years old….it belonged to my mother when she was little. Just place a page from an old book on normal printing paper and keep it in place with sticky tape. Place it in the middle of the paper, otherwise it might get stuck in your printer. Make sure the picture you want to print is in the right position (test printing helps) and there you go! – Makes perfect gift tags and christmas cards, as well!